Braces can help straighten your teeth and brighten your smile, but having to keep them on for so long can seem like torture. While the results may be worth the wait, that doesn't make the waiting any easier. Is there a way you can speed up the process? To get your braces off sooner can be achieved with some helpful tips in mind so that you can begin enjoying your new smile quicker. Just keep reading to learn the tips. There are plenty of foods you should avoid eating when you have braces. Nuts, popcorn, caramels, cookies or other stick or hard foods should not be eaten. Not only will this food damage your braces they can also cause your teeth to decay. Hard and sticky foods are some of the worst things you can chew when you have braces. They can bend the wires, pull your teeth in the wrong direction and the leftover food particles can become trapped in your teeth and increase the bacteria in your mouth. Along with watching what you eat, you want to make sure you are not putting extra stress on your teeth. Any raw vegetables should be cut up. This will reduce pressure on the braces and the risk of damaging them. Just as you want to avoid certain foods, when you have braces, you also want to avoid certain beverages. Carbonated drinks like pop or sodas can increase the time you have to wear braces because these beverages can damage the teeth. They can deteriorate the wires and make it more difficult to clean away any bacteria in the mouth. Your orthodontist should give you instruction on how to properly take care of your braces and these instructions should be followed. They will give you guidelines on how to properly care for your braces as well as what not to eat. As mentioned, how to get your braces off sooner will require eliminating sticky food items from your diet and this goes for gum as well. Gum will easily become tangled and stuck in your teeth and braces. Keeping your orthodontist appointments is vital to speed up your braces process. These appointments are scheduled to ensure your teeth are aligning properly and to make adjustments that will help you get your braces off sooner. Missing any of your appointments could set back your time frame for having to keep your braces on longer. When you develop a daily oral hygiene routine, you will take care of your teeth and ensure that they stay healthy and adjusting to the braces. Consider using an electric toothbrush when you brush your teeth as this can help with teeth alignment. If using a traditional toothbrush, choose one with soft bristles. Get into the habit of flossing after every meal to remove any food particles that can get trapped in your braces and between your teeth. 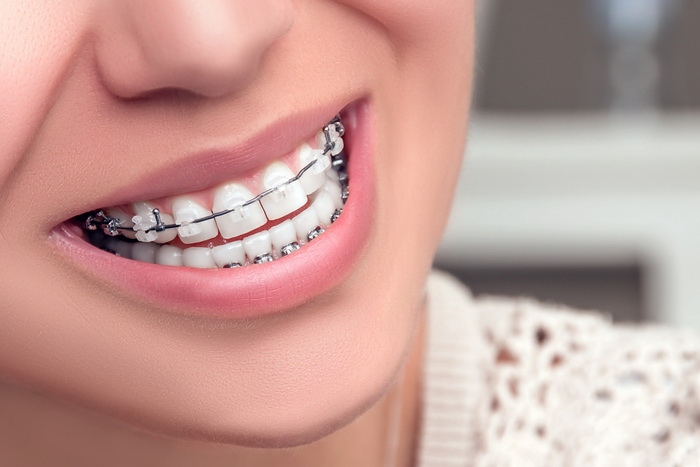 Wearing braces will require extra attention and care to keep all the wires clean. The healthier your mouth is, the faster your teeth are able to move into the right alignment, which means you'll be able to get your braces off sooner. How to get your braces off sooner? It will require you to stop any bad chewing habits. You want to get out of the habit of chewing on things when you have your braces on. Eating ice cubes, chewing on pencils or even biting your nails can damage your braces. Any non- food items should be kept away and out of your mouth. Many of these chewing habits can cause your teeth to be pushed back even more, which will result in more time your braces will need to be on. While those elastic bands can be annoying and difficult to keep on, you want to make sure you are wearing them at all times. Your orthodontist should provide you with these bands and they help speed along the process because they keep everything tightened and in line. Remember, you should not be playing with these bands and you don't want to constantly be taking them on and off. The only time you should remove these elastic bands is when you are eating, otherwise, they should be worn at all times, even when sleeping. Putting extra pressure on your teeth can cause damage to your braces, Often times many people do not realize when they are biting down on their teeth, even when they are not eating. This is a common behavior when people get stress or anxious, but you want to be aware that you are not clenching your jaw or biting down on your teeth when you are in stressful situations. Do your best to keep your jaw relaxed and if needed, speak to your orthodontist if you feel this is an issue for yours, especially when you sleep. For many adults, accelerated treatment might be an option for answering how to get your braces off sooner. These treatments can help speed the process when you have braces on. They can help the teeth move and allow your mouth to adjust to having braces on in a much shorter amount of time. Be aware that these treatments can be costly and may not be effective with all individuals. Consult with your orthodontist if you think accelerated treatment can help you get your braces off faster.